Last week Home School Legal Defense Association received another disappointing ruling in the Loudermilk case. In 2005 two social workers accompanied by six sheriff’s deputies threatened to take John and Tiffany Loudermilk’s homeschooled children into state custody if the Loudermilks did not allow the social workers to enter their home immediately. The social workers were investigating a two-month-old anonymous allegation that the home was unsafe. Faced with losing their children, the Loudermilks opened their doors to the investigators, and the allegation was quickly proven false. HSLDA sued both the social workers and the sheriff’s deputies for violating the Loudermilks’ constitutionally protected Fourth and 14th Amendment rights to home privacy. We argued that the search of the Loudermilks’ home was coerced because the social workers used the threat of taking their children to gain access. Both the social workers and sheriff’s deputies argued that they were immune to such claims because the Loudermilks “voluntarily” opened their home to be investigated. In 2010 the district court ruled in HSLDA’s favor. In response to that ruling, the sheriff’s deputies appealed to the Ninth Circuit which overturned the lower court’s decision, saying that the deputies were entitled to immunity from suit. 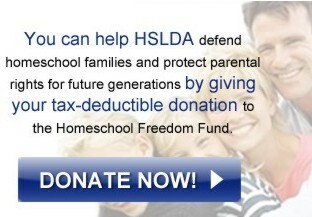 HSLDA was denied an appeal to the Supreme Court in March 2012. Following the decision in the sheriff’s appeal, the district court that had originally sided with HSLDA invited the social workers to re-submit a request for the case to be dismissed. HSLDA vigorously disputed such claims. While the sheriff’s deputies had arrived on the scene late and were not insisting to enter the home, the social workers were. It was the social workers who claimed that their visit was an “emergency” despite the allegation being two months old. The social workers, not the deputies, threatened to take the Loudermilk children into custody. Despite our response to the social workers’ request, the District Court ruled that the social workers were also immune from violating the Loudermilks’ rights based on the ruling of the Ninth Circuit in favor of the deputies. We are prayerfully considering whether to appeal. We believe that the Ninth Circuit’s ruling about the deputies was wrong, but that is water under the bridge. Based on the facts and the law, it is our view that the social workers should not be entitled to the same benefit of the doubt that the Ninth Circuit afforded the deputies. Numerous decisions of the Ninth Circuit have said that a delay in investigating is strong evidence that no emergency exists that would allow entry of a home without a court order. Other cases say that the emergency must be so imminent that even taking the time to get a warrant would be too risky. Please join with us in praying for wisdom.